In the 1960s as a small boy, I would experience the sound of sonic booms from Air Force jets on maneuvers from Tyndall and Eglin Air Force basses in northern Florida. It was a really cool sound to hear and feel. In olden days, a bullwhip would crack – the tip of the whip would actually pass the speed of sound making a crack of sound. 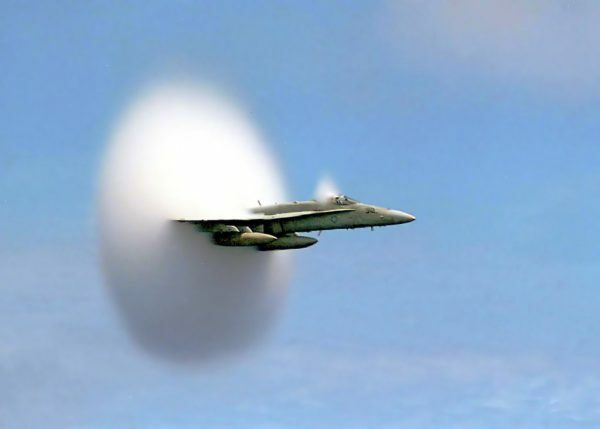 A small “sonic boom”. When would a human fly fast enough to break that speed? It did happen on October 14th, 1947 in an experimental air craft. 51 years ago. It was only a month after the US Air Force was established as its own branch of military service. A moment of great pride to this new USAF, but also to science. 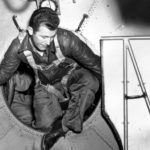 Captain Charles “Chuck” Yeager climbed into an aircraft designated as #46-062 – in the modified bomb bay belly of a B-29 bomber which Chuck had christened the name “Glamorous Glennis”. 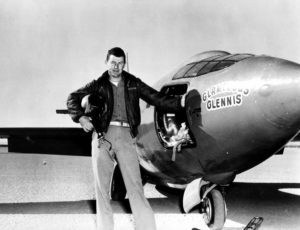 Chuck Yeager piloted the rocket powered craft to 807.2 mph at its peak speed. For the first time in history a human being traveled faster than sound. He glided the craft back to earth for a safe landing. The 20th century was an exciting time for many achievements such as this for mankind as well as science. This particular feat paved the way for many advances in aerospace. (VFA-151) breaks the sound barrier in the skies over the Pacific Ocean. VFA-151 is deployed aboard USS Constellation (CVN 64).